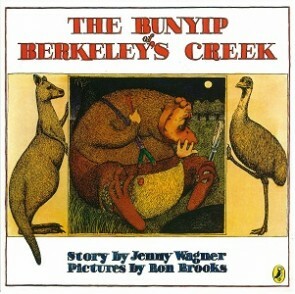 When the bunyip heaves himself out of Berkeley’s Creek, he has no idea what a bunyip really is! So he sets off to find out for himself. Jenny Wagner lives with her husband, their dog and three lazy cats in a small Queensland farmhouse that looks like a witch’s cottage. The garden is full of possums, lizards, goannas, frogs, scrub turkeys and other birds. Sometimes a couple of wallabies come to visit, too. Jenny likes writing best of all, unless it’s going badly, in which case she hates it. She also likes going for walks, listening to classical music, studying languages, doing cryptic crossword puzzles, getting together with friends and putting off the vacuuming. She doesn’t like racism, cruelty to animals or people, or getting up early. As well as her best-selling novels featuring the nimbin, Jenny Wagner has also written several very successful children’s picture books. The Bunyip of Berkeley’s Creek and John Brown, Rose and the Midnight Cat both won the Children’s Book Council of Australia Book of the Year Ward (Picture Books) and are widely considered to be classics.